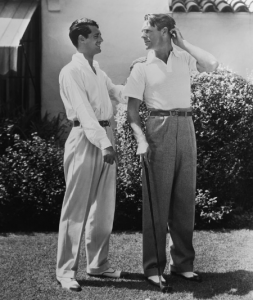 Think back to all those classic movies featuring a game of golf. Didn’t the clothes look fabulous? Classic, elegant, stylish. A round of effortless golf then back to a gorgeous Club House for afternoon cocktails. Hmmm – that’s the image, but the reality is rather different isn’t it? Somehow along the way beige and shapeless became the default and we think that’s a shame. We get that these days, no-one has the time (or money) to dry clean the sort of classic golf clothes we’d associate with Katherine Hepburn. But that doesn’t mean we have to throw style out of the window does it? 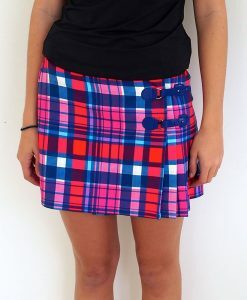 Unfortunately though, too many golf clothes (men’s and women’s) fall into the trap of ‘lowest common denominator’ styling – A line skirt, couple of pockets, stretchy fabric with ‘some kinda pattern on’ – done. Here at Pohli Golf we like to inject a little bit of style back into the game. In our first year of operation we’ve been delighted to have so many girls come up and say how fabulous our outfits look. They’re distinctive – and that’s how we want to keep it. 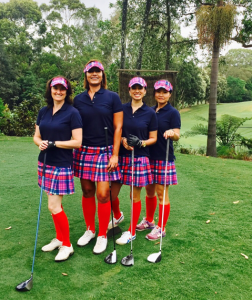 See how great these girls look at Pymble Ladies’ College golf day at Avondale Golf Club last week. This is how you put an eye-catching team outfit together. Start with one item that is really distinctive – the girls are wearing our Pohli Classic Kilt and Visor in Tasker Check – then showcase a couple of colours to complete your outfit with matching top and accessories – and we love those red socks girls! You just have to play better looking this good! Great New Range of Golf Wear from Pohli!